Alice's work as a photographer (particularly her captures of interior spaces and of all things culinary for me) is beautifully haunting and has a touching warmness to them. Along with taking on her own clients, Alice is currently a freelance "foodtographer" over at Serious Eats New York and has collaborated on a recent piece (see here and here) in Kinfolk magazine. She even did a little photo shoot for Marcus and me back in October of last year, where I pretty much fell in love with all of the resultant film snaps. She's a busy little bee, so I thank her kindly for taking the time to sate my curiosity about her food life with the usual Q&A questions at Four Tines. Having already been to 'inoteca and an Um Segredo dinner (thanks again for inviting me!) together, I'm sure there will be many meals ahead for us to share together! Thanks again, Alice! 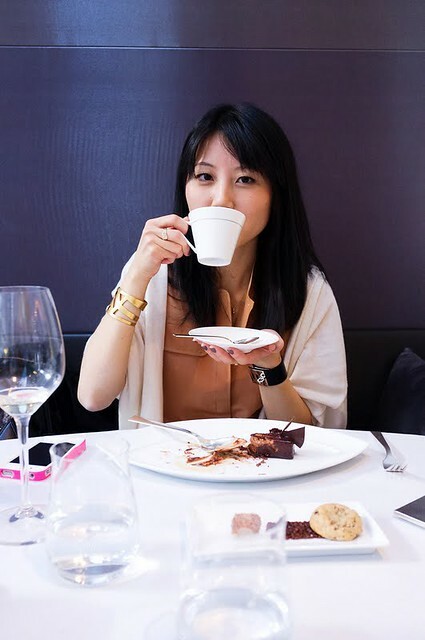 Alice, enjoying dessert at The Modern: Dining Room. I think the BEST meal I've ever had was at Alinea, but I would call Degustation my favorite all-time restaurant. I've always had such pleasant experiences there and I love that the ten-course tasting is just about all off-menu items, so each course is a little surprise. Hah, I have few secrets when it comes to what I eat. I used to secretly indulge in oatmeal with gochujang sauce. Let's just say I had a few bizarre eating habits in college. Well I don't exaaactly cook, but I'd say I really enjoy preparing coffee and breakfast in the morning. Something with eggs, toast, and cheese usually does the trick. And preparing a great cup of coffee (with a pour over or Chemex) is my favorite daily routine. I have YET TO GO TO PARIS. ARGH. I feel less legitimate as an eater because of this. Also would love to do food tour of Southeast Asia. It's a toss-up between Hearth's apple cider doughnuts and an incredible "smoked caramel" dessert from Corton that wasn't too sweet and had a great combination of textures. Oh, also the caramelized tortija from Degustation... I have had that dish more times than I can count, and I still love it to death. Noma: Time and Place in Nordic Cuisine for sure -- I regularly flip through the photos (by the amazing Ditte Isager) for inspiration. Also love my Richard Avedon photography coffee table book, Woman in the Mirror.